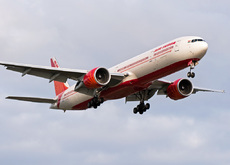 Air India flight AI101 diverted to Newark-Liberty International Airport, New Jersey, USA, after encountering instrument failures on approach to New York-JFK Airport. The flight attempted an approach to runway 04R at 11:52 UTC (07:52 LT), which the flight crew aborted when it became unstable. The flight subsequently reported having lost several instruments (localizer, altimeters among others). As a result of low clouds at JFK and the flight's inability to perform an ILS approach, it was decided to divert to Newark. A safe landing was made on runway 04R at 12:30 UTC.